Five of 17 new papers detailed rodent research, spaceflight studies that aid the study of molecular underpinnings to human disease on Earth. Four papers detailed remote sensing research that looks outward into space and may reveal fundamental aspects about our universe and its origins. Three papers detailed findings about cardiac stem cells, which behave differently in microgravity and may yield results critical for regenerative medicine. Additional R&D in protein crystal growth, nanotechnology, microbiology, and DNA sequencing also resulted in FY18 publications. 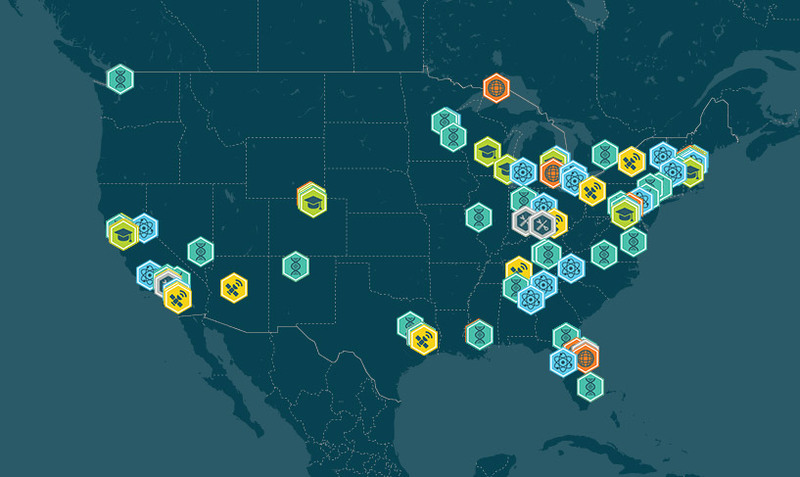 To date, 127 publications derive from ISS National Lab activities, 17 of which were published in FY18. Areas of study span from biomedical research to theoretical physics, and brief descriptions of the article findings are listed below. 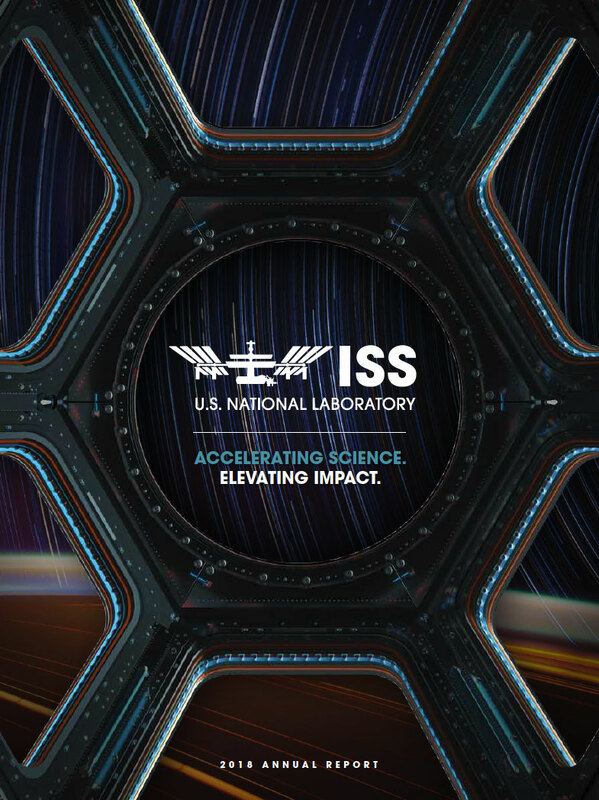 For detailed descriptions of the FY18-published papers and all ISS National Lab journal articles, see http://issnl.us/ar1832. Research using model organisms such as rodents provides insight into not only effects of spaceflight on astronaut health but also effects that mimic human disease on Earth, such as bone loss, muscle wasting, heart disease, immune dysfunction, and other conditions. Five FY18 papers discuss rodent research. To learn more about rodents in space, see the following resources. Unveiling “Musica Universalis” of the Cell: A Brief History of Biological 12-Hour Rhythms. Zhu B, Dacso CC, O’Malley BW. This article proposes a model in which mammalian cellular homeostasis and overall health rely on both the circadian (24-hour) clock and a 12-hour clock. Development of a Step-Down for Altering Male C57BL/6 Mouse Housing Density and Hierarchical Structure: Preparations for Spaceflight Studies. Scofield DC, Rytlewski JD, Childress P, et al. This study explores optimal housing for male mice on the ISS and is part of a broader line of research on bone healing in microgravity. Cohousing Male Mice With and Without Segmental Bone Defects. Rytlewski JD, Childress PJ, Scofield DC, et al. As part of a larger study on bone defects in microgravity, this study demonstrates that male mice with preflight surgical procedures and control mice can be cohoused under certain conditions. Childress P, Brinker A, Gong CS, et al. This paper demonstrates that mice that have sustained segmental bone defects can tolerate launch conditions, and the associated forces and vibrations did not impact the rate of healing. Nfatc1 is a Functional Transcriptional Factor Mediating Nell-1-Induced Runx3 Upregulation in Chondrocytes. Li C, Zheng Z, Zhang X, et al. This paper examines the role of T-cells in mediating molecular mechanisms that are essential to differentiation, maturation, and regeneration of cartilage cells. The Alpha Magnetic Spectrometer-02 (AMS-02) project is an international collaboration searching for evidence of dark matter and primordial antimatter to better understand the origin and composition of our universe. It has measured more than 100 billion particles since its launch in 2011, and four FY18 papers detail findings from AMS-02 data analysis. Learn more about AMS-02 and other ISS National Lab projects looking outward into space in the Upward article “On the Frontier of Space: Looking Outward to Better Understand the Universe Around Us”: http://issnl.us/ar1836. Observation of Complex Time Structures in the Cosmic-Ray Electron and Positron Fluxes With the Alpha Magnetic Spectrometer on the International Space Station. Aguilar M, Ali Cavasonza L, Ambrosi G, et al. This article analyzes the influence of solar activity and changes in the solar magnetic field on cosmic electron and proton intensities in LEO. Measuring these effects is important for understanding the overall stability of interstellar cosmic rays. Precision Measurement of Cosmic-Ray Nitrogen and its Primary and Secondary Components With the Alpha Magnetic Spectrometer on the International Space Station. Aguilar M, Cavasonza LA, Alpat B, et al. This article for the first time describes precision measurements of nitrogen nuclei in cosmic rays that distinguish between nuclei produced by stars and those created by heavier ions colliding as they travel through the galaxy. Observation of Fine Time Structures in the Cosmic Proton and Helium Fluxes With the Alpha Magnetic Spectrometer on the International Space Station. Aguilar M, Ali Cavasonza L, Alpat B, et al. This article analyzes the influence of solar activity on cosmic proton and helium intensities in LEO. Observation of New Properties of Secondary Cosmic Rays Lithium, Beryllium, and Boron by the Alpha Magnetic Spectrometer on the International Space Station. This article describes measurements of secondary cosmic rays produced by heavy ions that collide while traveling through the galaxy and compares experimental results with theoretical predictions. Tissue-specific stem cells are a promising cell source for regenerative medicine, disease modeling, and drug discovery. Microgravity induces changes in these cells that help scientists understand more about how they behave and how to manipulate them for biomedical use, and three FY18 papers detail findings from stem cell studies relevant to cardiac cell function. To learn more about cardiac stem cell research in microgravity, see the following resources. Hatzistergos KE, Jiang Z, Valasaki K, et al. This study shows that microgravity negatively impacts progenitor cells that form the autonomic nervous system, an impairment that may ultimately lead to cardiac dysfunction. Spaceflight Activates Protein Kinase C Alpha Signaling and Modifies the Developmental Stage of Human Neonatal Cardiovascular Progenitor Cells. Baio J, Martinez AF, Bailey L, et al. This study investigates cardiac progenitor cells and found that microgravity caused cells to express genes associated with earlier stages of cardiovascular development. 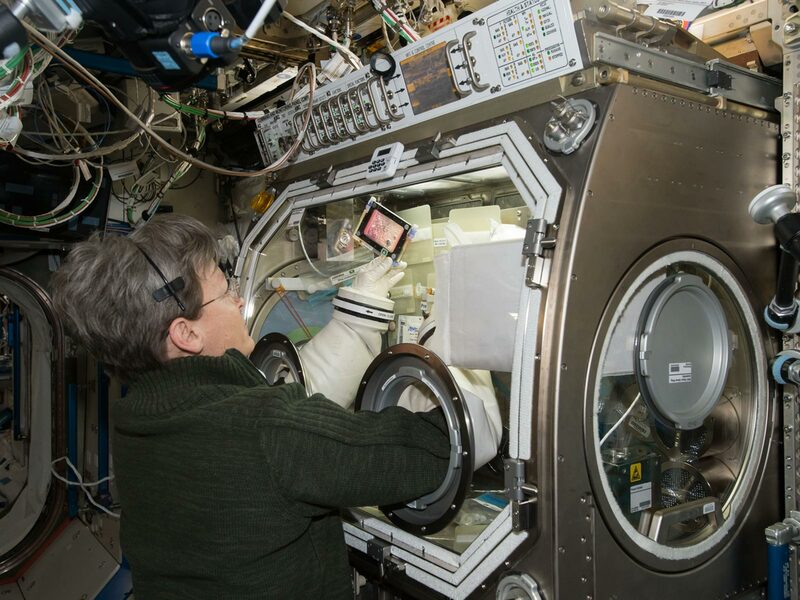 Cardiovascular Progenitor Cells Cultured Aboard the International Space Station Exhibit Altered Developmental and Functional Properties. Baio J, Martinez AF, Silva I, et al. This paper characterizes changes in genetic expression of cardiovascular progenitor cells grown on the ISS and indicates that spaceflight enhances regenerative capabilities, a significant finding for improving the efficacy of cell-based therapies. High-quality crystals of organic molecules, such as proteins, can lead to improvements in drug development, formulation, manufacturing, and long-term storage. Space-grown crystals are often larger and more well-ordered than crystals grown on Earth, and two FY18 papers discuss protein crystal growth related to ISS National Lab projects. To learn more about space-based protein crystal growth, see the following resources. The Structure of iPLA(2)β Reveals Dimeric Active Sites and Suggests Mechanisms of Regulation and Localization. Malley KR, Koroleva O, Miller I, et al. This paper presents a novel crystal structure of calcium-independent phospholipase, which is genetically related to Parkinson’s disease and other neurodegenerative conditions. Direct Visualization of Critical Hydrogen Atoms in a Pyridoxal 5′-Phosphate Enzyme. Dajnowicz S, Johnston RC, Parks JM, et al. This paper presents the structure of an enzyme dependent on pyridoxal 5′-phosphate, the active form of vitamin B6. Additional publications in biomedical research round out a diverse year for publications. For additional information on the projects and research areas behind these publications, see Success Stories and the following resources. Unexpected Behaviors in Molecular Transport Through Size-Controlled Nanochannels Down to the Ultra-Nanoscale. Bruno G, Di Trani N, Hood RL, et al. This paper examines molecular transport in a nanofluidic platform, which has applications in desalination, fuel cells, and drug delivery. Spaceflight Modifies Escherichia coli Gene Expression in Response to Antibiotic Exposure and Reveals Role of Oxidative Stress. Aunins TR, Erickson KE, Prasad N, et al. To better understand how to combat antimicrobial resistance, this experiment investigated the cause of increased antibiotic resistance that E. coli displays in microgravity and discovered that upregulation of stress response genes is a contributing factor. Successful Amplification of DNA Aboard the International Space Station. Boguraev, A.-S., Christensen, H. C., Bonneau, A. R., et al. This study outlines the use of polymerase chain reaction onboard the ISS to amplify DNA and detect genetic alterations.